Do I REALLY need to warn you? 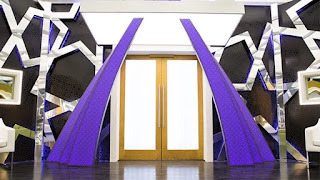 [Update June 18: The official team announcements were made Monday, June 15 to Thursday, June 18 as follows: Monday, June 15 on eTalk; Tuesday, June 16 on CanadaAM; Wednesday, June 17 on The Marilyn Denis Show; and Thursday, June 18 on The Social. 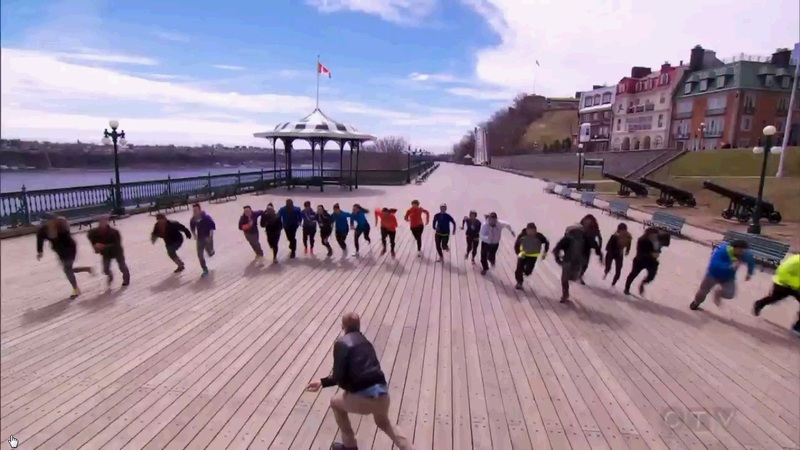 The Season 3 startline was in Quebec City - filmed May 1, 2015. It takes a bit of zooming in, and a bit of analysis, but this pic - taken very timely at the Jon Montgomery "GO" moment, shows there are 12 teams this year. That's right...12. One more team than last year. Update from "Meet the Teams" Preview, our first official look at the startline verifies my original identifications. Neil is a CFL Hall of Famer, earning 3 Grey Cup rings with the Edmonton Eskimos. Neil and his daughter Kristen know racing together will be a test of will as they consider themselves stubborn people who both have to always get the last word in. Team Motto: Play like a champion today! My Assessment: Don't dismiss Neil's age here, he is going to outlast a lot of stronger, younger teams and prove to us all that it takes a lot more than physical strength alone to do well in this race. I am looking forward to seeing the interaction between a father and his adult daughter during these tasks, especially two strong-willed, stubborn people! Don't worry, I think they will become fan favourites because of it! Power Ranking: Father Knows Best...well, mostly. 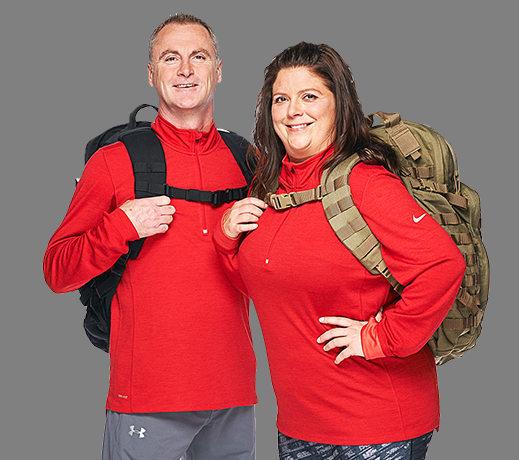 Brian and Cynthia first met 20 years ago while they were both serving in the Canadian Armed Forces. They married four years later and are now both working as Police Officers protecting the city of Winnipeg. They believe their on the job strategic and perceptive abilities will be transferable skills for the race. Team Motto: Adapt and overcome...failure is not an option! 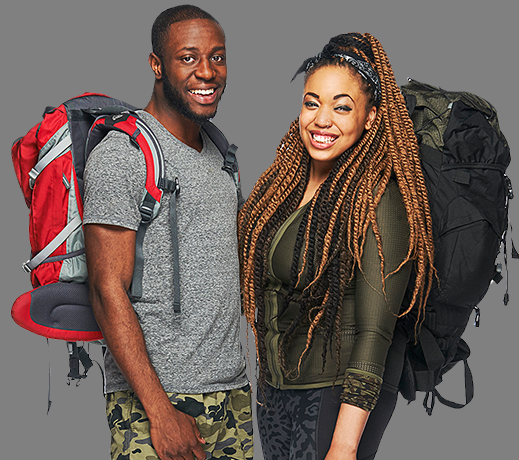 My Assessment: Brian and Cynthia are this season's token married couple. I wish I had more to say here, but I don't. Their official bios don't give me a lot to work with. I mean, they aren't even the only team representing law enforcement. So, I am left with hoping these two will be the bickering couple, or at least provide us with a few zingers....after 16 years of marriage, they must have built up quite a repertoire, right? Toronto, Ontario - originally from Musquodoboit, N.S. These two brothers were living a quiet life in Musquodoboit, Nova Scotia when they decided to move to Toronto to study Design. That doesn't mean they have forgotten who they are. 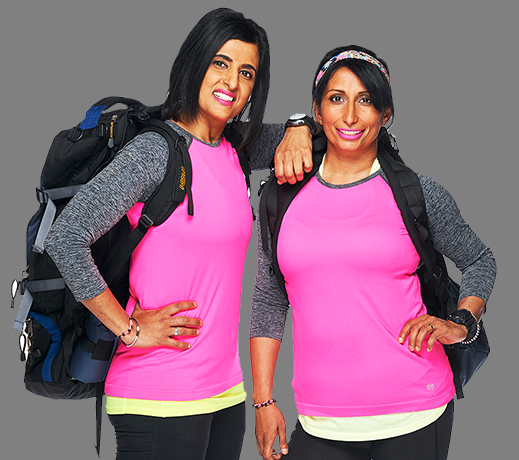 They know they won't be the strongest team this season, but they plan to overcome that by making good use of their down east charm and humour. Team Motto: Beasts from the East! My Assessment: No, they definitely aren't the strongest team in the field this season, but a team's strength has never guaranteed a win on this show. Sure it matters, but so does staying cool under pressure, determination and good old fashioned luck. And there is a whole province hoping that with a little luck, these two brothers will bring home a win. Power Ranking: Designed to go far. Ope and Simi (and family) immigrated to Canada from Lagos, Nigeria back in 2006. Ope is a social, friendly guy who loves to tell stories. Simi found she had to take drama in high school to get over her shyness. Although Simi sees her father as her hero, it's her mother the lawyer she wants to emulate. Team Motto: You gotta risk it to get the biscuit! My Assessment: Well, well, well. We have not one Father/Daughter combos this year, but two! This one came as a bit of a surprise, because in all the sightings, there wasn't a clear shot of Simi's face. Simi and Ope are about as cute as can be and I have a feeling they may become fan favourites. Here's hoping we hear some of Ope's stories along the way! This newly engaged couple met 6 years ago when they were both in military cadets. Despite their young age, they are world travellers having recently returned from backpacking in Europe. Hamilton is transgender, and has been transitioning since he was 15 years old. Team Motto: Go big or go home! My Assessment: My God, these two are youngens! But just like Neil, don't discount them because of their age. They may be the youngest team this year, but they are far from naive. They've done some world travelling, and will be right in the thick of things - at least in the early legs. Since the official team announcements, Hamilton has attracted a lot of attention and is sure to become a fan favourite and an inspiration to transgender youth not only in Canada but worldwide. These two girls have known each other since they were 15 years old and competed against each other in high school sports. They then became co-workers when Dana was accepted into the Royal Newfoundland Constabulary, then helped Amanda with her application. 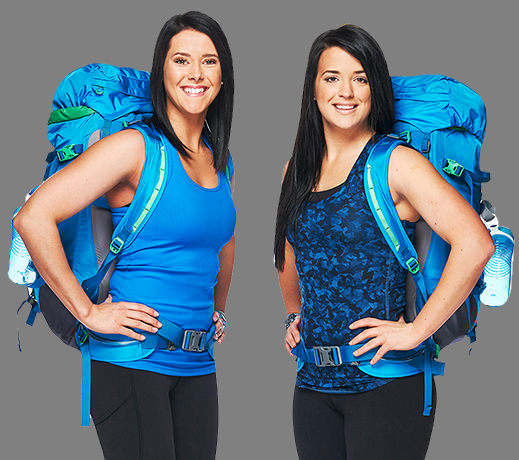 They are now both serving at a remote, northern station in Labrador. Team Motto: Face every obstacle with the warrior mentality. My Assessment: What is it about law enforcement teams not doing well in Amazing Race Canada? Well, there was Jet Black in Season 1 who holds the record making it as far as episode 9. Is there something about the job that isn't a transferable skill? Here we have two intelligent, young, athletic women, but alas, it's not meant to be. Power Ranking: Book 'em, Dana! Nic and Sabrina are another couple that have just recently just started dating. They have been together for one year and have only recently returned from Italy to live in Canada. They both fear water, but Sabrina has volunteered t do any water-based tasks. Team Motto: If you don't laugh, it's not worth it! My Assessment: This is one of those teams that I will have to wait to see on TV before I can really give any opinion. They just seem like the average couple on paper, although to some degree I am picking up a "Holly and Brett" feeling about them. I wonder if Nic will call out, "Sab, Sab, Sab"? Oh wait, this is interesting: Sabrina is 10 years older than Nic - not that there's anything wrong with that. They may also remind me of Alain & Audrey - remember Paris? Susan and Sharnjit first met when they were both hired by Corrections Canada 16 years ago. They weren't friends at first, but they soon bonded after finding themselves under the same working conditions - as correctional officers guarding male inmates and being females in a male dominated profession. Team Motto: You got this! My Assessment: I really like these two. I have an appreciation for the jobs they do. They are right...their line of work, and being female in a male-dominated workplace is NOT easy. Their official bios look promising - they had all the right stuff. But sadly something must have happened that knocked them out of the competition. Gino and Jesse are athletic Italian-Canadian brothers who praise their Single-mother for giving them their strength. They also compare themselves to season 1 team Jet and Dave, which means they are A-Okay in my books. But look out guys...those are some pretty tall boots to fill! Team Motto: Losing is NOT an option! My Assessment: Holy smokes, look at these two! A couple of good looking Italian-Canadian working dudes from Hamilton. And they love their Momma! And hey, aren't they good looking? Okay, I'm repeating myself. Yes, I really hope they are like Jet and Dave and give us some comic entertainment, but this team is the one to watch on so many levels. Power Ranking: Voted the most likely to grab the pitcher of beer off Jon! Elimination: In the Final 3. Dujean and Leilani are professional dancers who first met each other while watching friends perform in a dance battle. They dated, but came to realize they made better friends than lovers. They know their dance skills will be an advantage in any dance task - and there is always one of those somewhere along the race! Team Motto: Feel the rhythm, feel the rhyme, get on up, it's winning time! My Assessment: Okay, I am tempted to take bets here. These two are either exactly what they say: a couple of good friends who used to date OR they are going to provide us with a few awkward on-screen "discussions". My money is on the latter. In fact, I think I better add, "find awkward reaction gifs" to my To-Do List. These two have only been dating for 5 months. Gee, is this going t be a test of their relationship, or what? Elias is a promising MMA fighter that goes by the name The Spartan. Team Motto: Don't look dumb on TV, and don't die! My Assessment: Stunt casting...UGH, I hate it! Oh, I know what you're thinking! "An MMA fighter. Right. The other teams don't stand a chance!" Well, sure I understand. I mean, willya look at the size of this guy? Come on! But hold on a minute folks. Hold on. Let's not get carried away with this one, okay? Sometimes things don't always work out the way you plan, and this must have been one of those instances. I suspect it was the new Face Off task that took the giant and his girlfriend down. If true it must have involved an activity Max or Elias possessed no talent in. Ouch. This could get awkward. Let's hope there's no irony in that team motto. It's a good thing Elias has that MMA gig to fall back on. Or the romance book cover modeling thing. Power Ranking: The bigger they are, the harder they fall. Nick and Matt are a pro-wrestling team better known as Asylum & Burns OR The Flatliners. They have been friends and teammates ever since they bonded over their shared admiration of wrestling stars. They are certain their wrestling skills will help them improvise and go with the flow during the race and they see themselves as good-natured, humorous and down-to-earth. 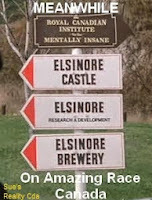 Team Motto: The more you think, the more you stink! My Assessment: I don't know what the intentions were originally. Were Nick and Matt cast to be the antagonists to Max and Elias, or was it meant to be the other way around? I'm sure we will see some tension between these teams in the premiere - but that will be the end of it. Where Max and Elias fail, Nick and Matt will deliver. I also expect some comic relief from these two. I mean...look at those faces! A couple of big galoots if I ever saw them. 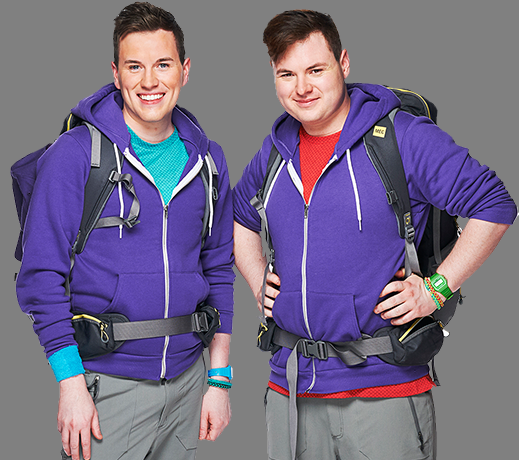 I am hoping they will be the equivalent of my favourite team EVER - TAR Season 1's Kevin & Drew, of course! I hope there's a zip-line task somewhere along the way! Or at the very least one with snakes. I think they may also be the team that's always finding trouble. You know what I mean. Bad taxi drivers or maybe a missed connection somewhere. I sense a few gifs coming on! Power Ranking: Wrestling for a spot in the Final 3. A note concerning eliminations: although I have made my best guess concerning the elimination order, the only real information I am going on is the location each team was last seen. And it means exactly that - it is where they were last sighted. It does not necessarily mean they were eliminated on that leg! Just because a team wasn't seen does not mean they were eliminated BUT it does mean they are the best candidate for possible elimination. For instance, they could be saved by an NEL (Non-Elimination Leg) and if they are not eliminated on that leg, then they soon will be. There are 3 all-male teams; 2 all-female teams; and 7 male/females. There are 2 father/daughter teams; 2 brother teams. There are 3 dating or engaged teams and 1 married team. There are 3 co-worker teams. There are 7 out of 22 people who identified snakes as their biggest fear. Will there be a task involving snakes? There were 4 locations revisited this season: Quebec City; Toronto; Halifax; Vancouver. I am slowly adding in my team assessments and the elimination order, so keep checking back. 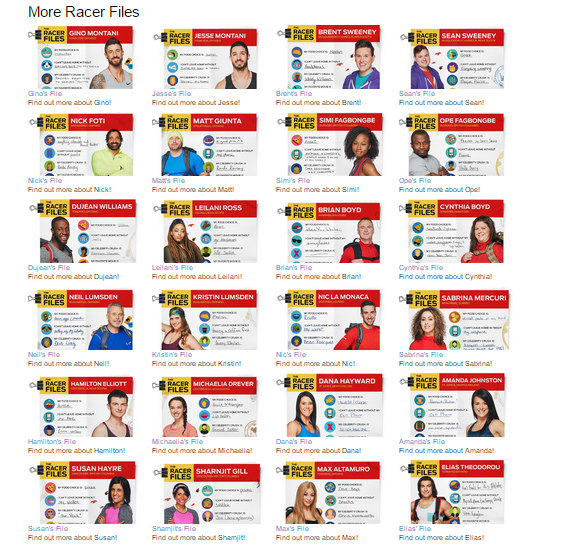 Update August 2015: The official site set up a new feature (I believe this was originally posted after Leg 7,) called "Racer Files" which you can see BY CLICKING HERE This link brings up Gino's "file", however...scroll down and you will see the entire cast. Notice anything? Start at the bottom and work your way up. So, what are your thoughts? Was this a monumental screw-up? Did TPTB spoil their own show? Or is this a classic case of misdirection, a foiler? 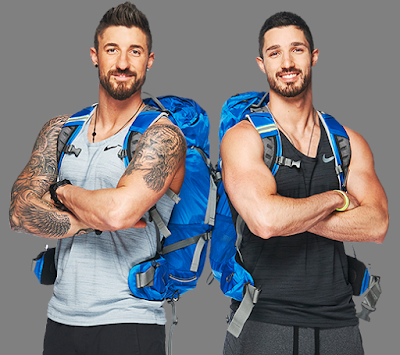 I can tell you that the general speculation among spoilists is in the finale: Gino & Jesse win the season; Brent & Sean take 2nd; Nick & Matt come in 3rd. It was also generally speculated that Neil & Kristen and Brian & Cynthia were the 6th & 7th eliminated teams. I am not as convinced OF THE FINAL 3 PLACEMENTS. In fact, I keep flip-flopping. I can only say for sure of the 3 teams in the finale, not 100% how they placed. If you hear anyone say, "I know who won", they may THINK they do BUT THEY CAN ONLY BE SPECULATING. And one final word. Please respect the work I have put in compiling these spoilers. If you want to use any of the information on your own blog, forum or whatever, that's fine BUT please quote your source AND provide a link back to here. Better yet, tweet it out!!! And please do not hotlink any pictures. Thank you.